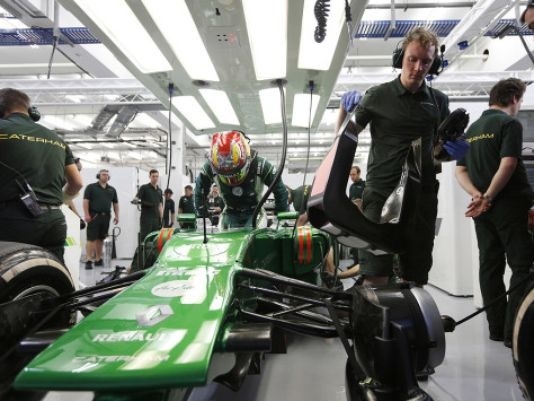 Engineers working for Caterham, a UK-based Formula One racing team, have embraced a new way to keep up with their rivals: 3D printing. The creation of titanium and aluminum parts via modern 3D printers makes for cheaper, faster production of prototype parts in a sport that demands continuous upgrades if a team wants to stay competitive. This kind of 3D printing—referred to in the F1 paddock as "rapid prototyping"—lets Caterham's engineers print parts to exact specifications, which saves the company both time and money. Prototype parts are printed to a 60% scale and tested in a wind tunnel prior to finalization. In a recent interview with the Financial Times, prototype manager Ian Prince revealed that Caterham is printing upwards of 800 parts a month to meet demands for "constant development all year round." The process is saving the team as much as $800,000 each year—a number that's expected to rise as associated costs of 3D printing drop. Many manufacturers outside of the racing world are also jumping on the 3D printing bandwagon, including scientists in the dental and orthopedics industries who have adapted the 3D printing process to medical-grade silicone. And last month, the UK government announced a £15 million investment towards a National Center for 3D printing.